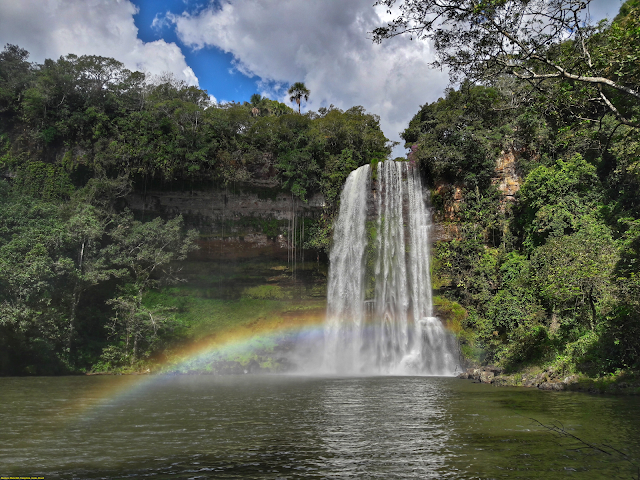 The waterfall of the Pumpkin presents a fall of 52 meters and is one of the most beautiful of Goiás, with a large volume of water and a very deep well. To get there, from Caiapônia, you will also follow the BR-158, passing by a dirt road. The trail is heavier with a 30 minute walk. Goiás Turismo recommends the accompaniment of a local guide. Once it was called Torres do Rio Bonito, it was named Caiapônia, still there is a municipality called "Rio Bonito" in the state of Rio de Janeiro. A building that reminded the golden age of this small town. There were those who defended its revitalization and the implantation there of a museum that keeps a little of the history of this place and of this peculiar people. The municipality is known for its countless waterfalls, such as the Santo Domingo Waterfall, Jalapa Waterfall, Samambaia Waterfall, Sereno Waterfall, Abóbora Waterfall, Verdão River Waterfall, Rio Bonito Waterfall, Santa Márcia Waterfall and Cachoeira do Swamp, among many others. Another tourist attraction are the hills, such as the Morro do Gigante and Morro do Peão, also having several mountains, a great option for adventures.